It's about 100, actually. With the width of the monitor setup it feels more natural to have a lot of peripheral, as it takes up most of my peripheral vision. Having peripheral like that makes the height of everything feel very dramatic, by the way. Never experienced that sort of instinctual sense of "that is a very far way to fall" before the 3 monitor rig. 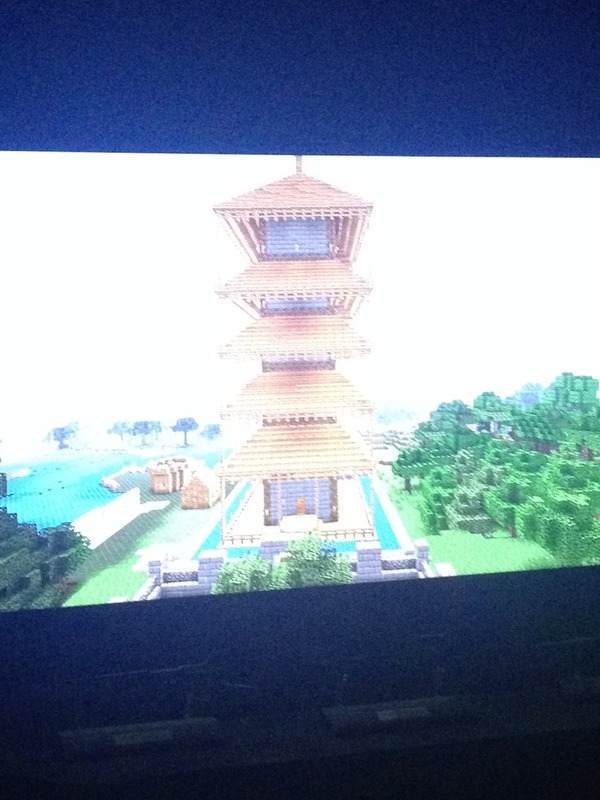 Currently building another Pagoda, and I've done more landscaping. Will take a picture later tonight when I play on my PS3, promise.....can't promise much about uploading it tho. You know what I'm like. Number one, and half way through number two. The first one, and a couple of birch trees that are in a middle garden area. Reallllly bad shot of First, the birches, and the pool under the trees. You can just about see the moat around first pagoda. Even blurrier pic. 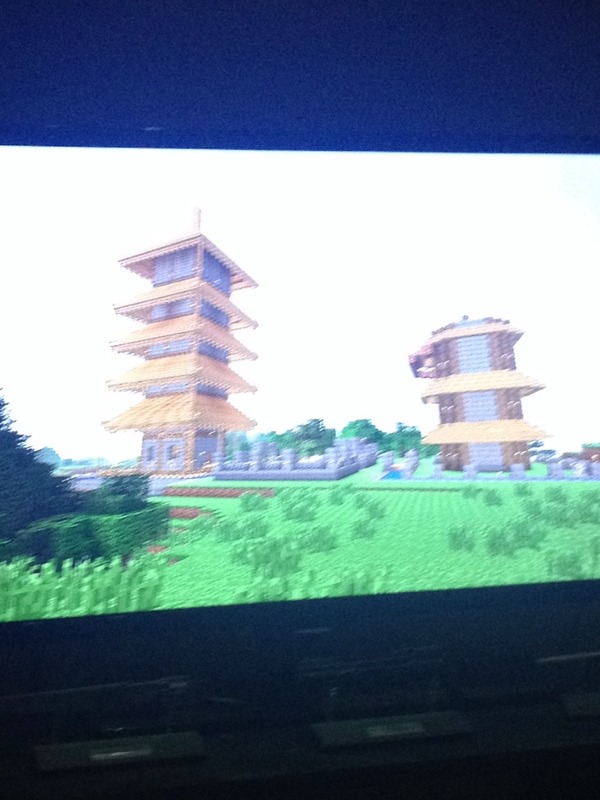 If anyone knows how I can take better pictures of a tv screen, I'd really love to know. Can you get through 5 extremely difficult parkour-style obstacles without failing? Visit my world to find out! I really need to play again this weekend. I'm so bad at parkour but sometime when I'm not on the way out of my house I'll give it a whirl! I will be the first to beat it. I already raged quit yesterday trying to do it. 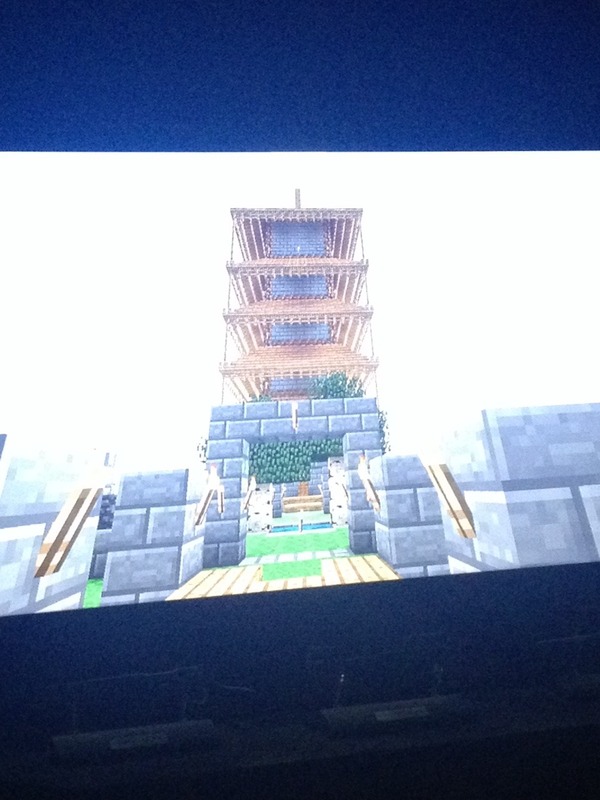 Just started playing Minecraft on X1 again with my friends last week. I forgot how fun it was. I just got my mega-world to load up again today, no noticeable corruption. It may be time to go back in... and I've kind of missed it. Had some missing/corrupt chunks in the save file but 1.8's new loading procedures otherwise seem to be working fine. 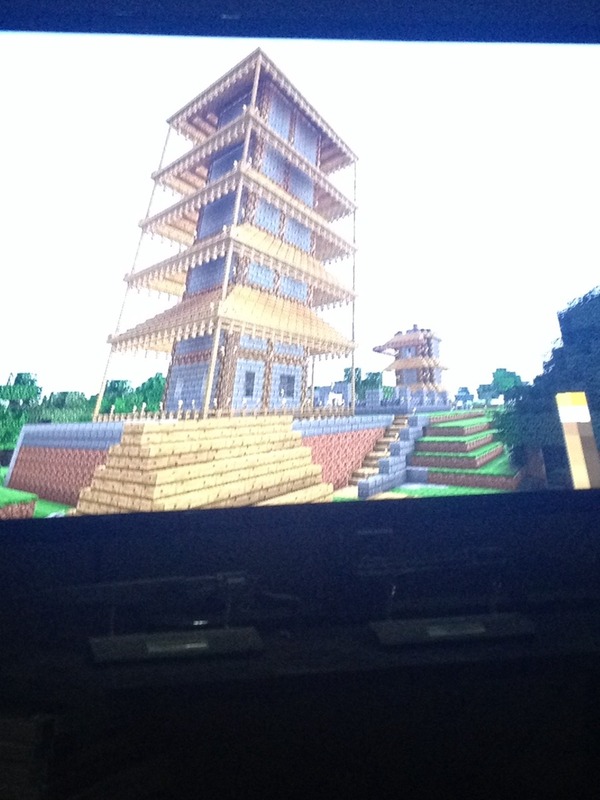 Started building a town last night as I abducted and cured a zombie villager (with Scarecrow's help). I like all the new minerals. Hoping Forge is updated soon so I can put some shaders on it and take some really cool screens of all the crazy stuff I've built. I enjoy playing in your world, AYEEYE... and am looking forward to exploring and finding rabbits. Friendly rabbits. So I built a 3-way stop on my rail and then proceeded to spend an absurd amount of time figuring out a 3-way XOR logic gate, just so we can use levers to switch the track directions. I don't really know how anyone else does it in the game, since I didn't have the patience to find a method online, but mine works pretty well (despite requiring a lot of space for such a simple function). Redstone is really finicky. Think I'm going to connect the two major lengths of rail we've got so far pretty soon, it'll be cool to ride from one extreme to the other without switching tracks. I saw rabbits for the first time yesterday, and also recently found an Ocean Palace which had apparently spawned in an existing chunk randomly near my really bloody long rail. Also logged in to mess about on S1x's server again recently, but didn't spend a long time there. Okay, I've cracked. 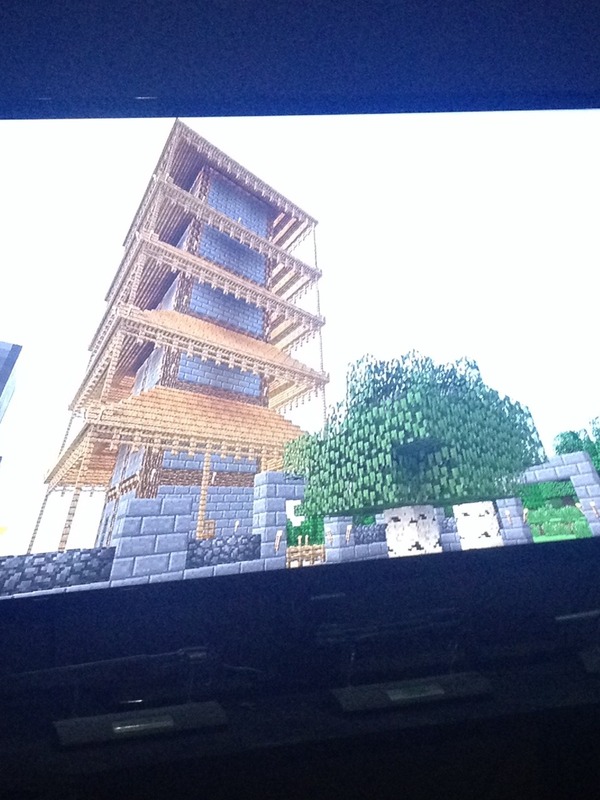 I'm now playing multiplayer on minecraft. Happy to play on anyone's Realm. Name is Nomyt.